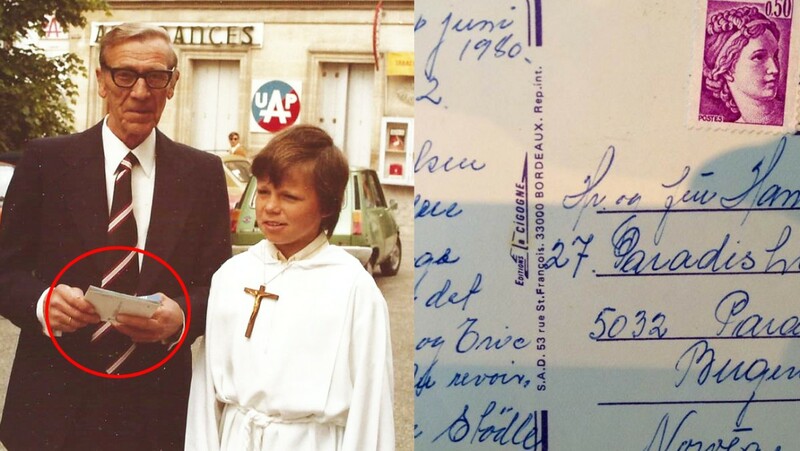 Bordeaux,1980: Nicolas and his grandfather at the confirmation ceremony. His grandfather is probably holding the same postcard on the photo. 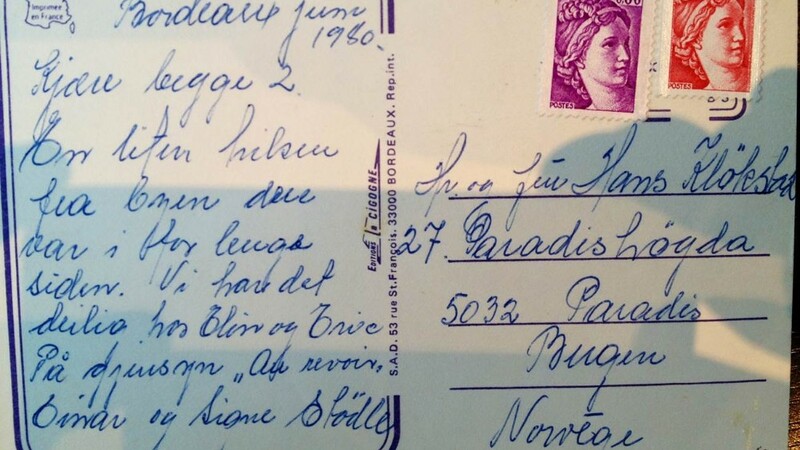 French-Norwegian Nicolas could hardly believe what he saw when he looked through a stack of old postcards at a secondhand store in Kristiansund. Among the many postcards he found a card that was written by his grandparents from Bergen. And, if that’s not amazing enough – it turns out that the card was sent from Nicolas’ confirmation ceremony in Bordeaux in June 1980. – It is absolutely crazy. The odds of that happening… No, it’s completely incredible, Nicolas tells NRK. Nicolas Mahé de Berduoaré (45) is half French and half Norwegian. He was born in Bordeaux, but his mother and grandparents come from Bergen. 17 years ago, he moved to Norway and today he is married to a woman from Kristiansund. They live in Oslo, and Nicolas works as a wine merchant. Recently he visited his in-laws in Kristiansund, and accidentally dropping by the secondhand store Postkorthjørnet (Postcard Corner). On one side of the room was several shoe boxes of old postcards, and the shop contains about 100,000 of them. – They were organized by country and district so I started to flip through the stack of cards from France. There were very many cards, he says. Suddenly, he stopped at an old postcard from Bordeaux. – I thought it was fun, so I turned the card. I recognized my grandfather’s hand writing immediate, says Nicolas about the incredible discovery. – We had a very good relationship, I and my grandparents. So when I found the card, I took it as a sign from heaven. It warmed my heart and made me very, very happy. Dear you 2. A little greeting from the city you visited a long time ago. We are having a great time staying with Elin and Erik. Goodbye, “Au revoir”. Einar og Signe Stødle.